Designed for easy on the go vaping, the Magic Flight UFO Bubbler is a stylish bit of kit with a difference. It hooks directly to your Magic Flight Launch Box before turning any glass of water into an easy to setup water bubbler. 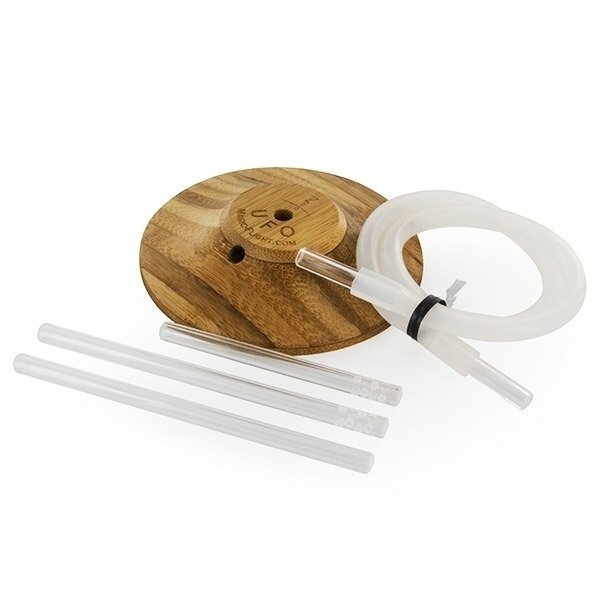 It is perfect for when you are out and about, or want to have a smooth water-vape at home. All you need to do is go grab a glass of water from the kitchen! Magic Flight - UFO Bubbler: water-vaping on the go. The Magic Flight UFO Bubbler has been specifically designed by the founder of Magic Flight himself to offer users a quick and convenient way to vape while on the go. All you need to do is link it up to your Magic Flight Launch Box, and put it on top of a glass of water – then you are free to bubble away. Shaped like a UFO, this awesome device from Magic Flight is made from laser-etched, water-resistant bamboo. Thanks to the gasket on its underside, it is compatible with most sized glasses, and can comfortably seal to the rim. The draw pipe, two down stems, and whip to connect to the launch box are all made of acrylic. The down stems are actually perforated, allowing for better bubble dispersal. Furthermore, it all nicely fits into a snug little velvet pouch for your pocket, allowing for smooth water-vaping no matter where you are! As a mark of quality, each Magic Flight UFO Bubbler is handmade by Magic Flight, at their offices in San Diego, USA.